The onslaught of tomatoes has caused a bit of a conundrum here. I am thrilled that the cherry tomatoes have done so well, but people are beginning to hide from me when they see me coming with my little basket brimming with toms. It reminds me of a funny NOW story. It wasn’t at all funny at the time….well maybe a little. Our papa always had an amazing garden. It was one of those that fed us all summer and then through the winter and into the spring when he started planting again. Of course, none of that was possible without our Meme. She was the bean shelled, the canner, slicer, freezer, etc. Meme put up all that stuff Papa grew. Meme died about four years before Papa…..but Papa never stopped planting. He worked mama into the ground trying to keep up with him. The last two years of his life he decided that he should plant mama’s yard too. He had two enormous gardens, 10 miles apart and saw to them both. He actually passed away in mama’s garden. But, that’s not what I meant to wonder off to….. After Papa died I moved into his house so it wouldn’t be empty. It was early June and the vegetables began rolling in. I didn’t cook much then and was overwhelmed. Henry and I use to pick and pick. I would go door to door to all of his neighbors giving away produce. I took it to work. I did the best I could to get rid of it…..and people began hiding from me. Apparently, you can have too much of a good thing! 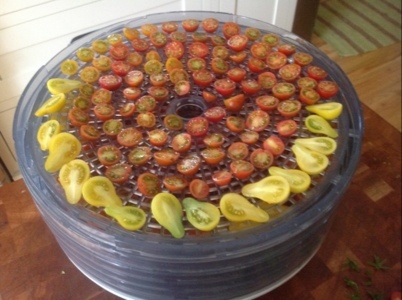 I am drying aBout a pound of the cherry toms to pack in oil and basil for the winter. This entry was posted on July 20, 2012 by slippingthroughmyfingers. It was filed under Uncategorized and was tagged with cooking, drying, garden, tomatoes. 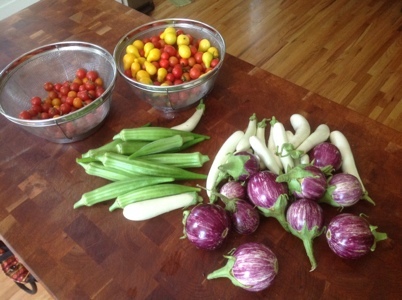 do you remember the time heather took veggies around to the neighbors on Turley and sold some – all because i was snowed under with trying to put up 2 garden’s worth of stuff?? daddy was ready to kill me and made heather go back to each neighbor’s house and give them their money back. i really miss him. No. I never knew that story!